Fireworks, NASA, cichlids, great restaurants, good friends … what else could anyone ask for? Initial reports tell me that everyone had a great time at the convention in Houston. A special thanks from the ACA to all of those that made the event happen! Now, to take a breather, collect your thoughts, get your new fish acclimated and set your sites on next year. I was sitting on the sidelines of a discussion where prominent fish guys were discussing a certain topic. The banter was back and forth and all was well until one guy came into the conversation. He was irate! How could you think that? I cannot be a part of a club with people like you in it! (It was not the ACA.) Rant, rant rant …! I’m quitting this group. Really? Sigh! Here’s the deal. We all have our personal beliefs. If we are discussing things on our PERSONAL PAGES, keep it there. Do not let it bleed over into the club or organization business. We all enjoy fish, we all enjoy breeding our fish and learning about them. So, build on that common ground. One person can be red, the other blue and a third way out there (either way) but what goes on in their personal discussions should in no way affect your fishy relationships. Accept that we all have different beliefs and interests, unless, of course, you keep those (fill in the blank) types of fishes. Be cool and enjoy the differences between us and remember the most awesome advice of Bill and Ted: “Be excellent to each other!”. Holy Cow! Peter George and the crew at NECA are getting a great start on next years ACA 2019 convention. The FB pages are flowing with information. If you are planning to take a vacation next year, make sure it includes the ACA. Look at the convention flyer and the FB pages for more information. A while back, I asked the question: Is the ACA a hobby group or an educational/conservation organization? Richard Stratton, one of the founders of the ACA, came up with the sage answer, “Why can’t it be both?” That is exactly my thought on the matter. So, okay, the ACA is a fish club, you get that. The shows, the talks, the convention, the parties, the auctions which sometime become the parties, BB, AN, TP, fish and their husbandry are the main attraction for many of you. But, there is the other side of the ACA, the non-profit organization, that I think needs to become more of our focus. Conservation, Research and Education. What exactly does that mean? What does that entail? Last year, as Chair, I, with the help of Tim Hovanec, established a tiered membership system where if you donate more to the ACA, you would gain recognition. It’s always nice to be recognized for your efforts. One person donated to three different causes and earned a Life Membership, I added to my Life Membership and became a Patron, another a Conservation level Life membership was given for a $2,000 donation. We even had a Chairman’s Circle donation. Outstanding! A complete list of these generous donors will occur in a future issue. Why donate? So the ACA can do bigger and better things in the arenas of Education and Conservation. From the ‘Wild Caught’ video which is nearing completion to the repopulation of Lake Tseny in Madagascar with endemic cichlids, the ACA is on the move. Les Kaufmann, Paul Loiselle, Peter George and I have been tossing around a few more ideas for future projects, too. These projects may possibly be concerning Lake Malawi and Lake Victoria. We shall see. The ACA can remain exactly the same on the hobby side. There is no need for a change in that aspect but we can be doing so much more if we have the funding in our special projects. And for that, we need the generosity of our members, our sponsors and other donors. We also need officers/cadre and BOT members who share the vision of how the ACA can not only help the hobby but help with conservation, research and education. 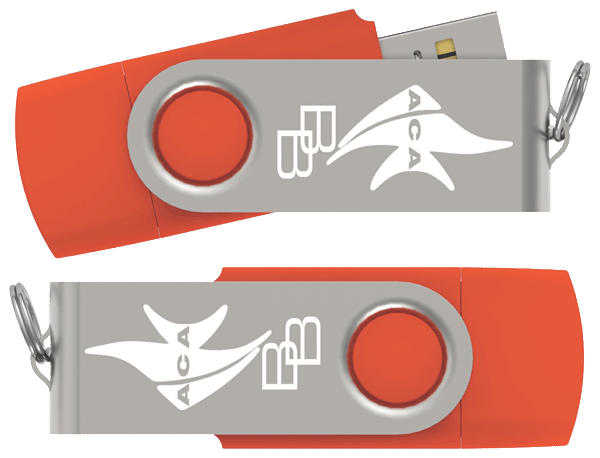 Become a Life Member and help Conservation and Education efforts, too! $5,000 – or more Chairman’s Circle. ◆ You can also build incrementally and get to the next level of recognition. ◆ All Patron Members and above will be listed in an annual publication of donors. ◆ All donations and membership dues are tax deductible. 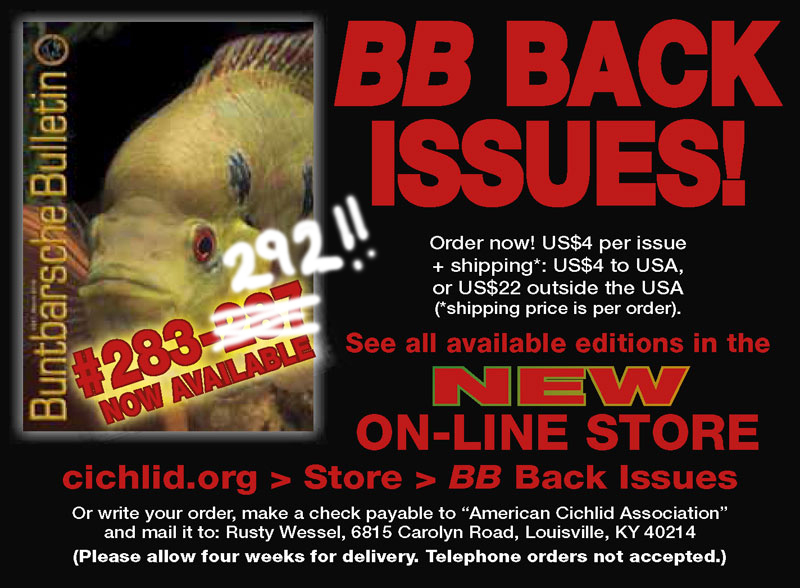 The American Cichlid Association is a registered 501.c.3 and will provide the proper documentation for the tax write-off with all donations of $75.00 or more. Congratulations to Jan Benes for her entry into the esteemed ranks of the Fellows of the ACA. Jan received her award at the convention in Houston. I told Phil Benes, her husband, about the award months beforehand and it tortured him as he kept it a surprise for Jan. Heh Heh! I really am a mean guy! 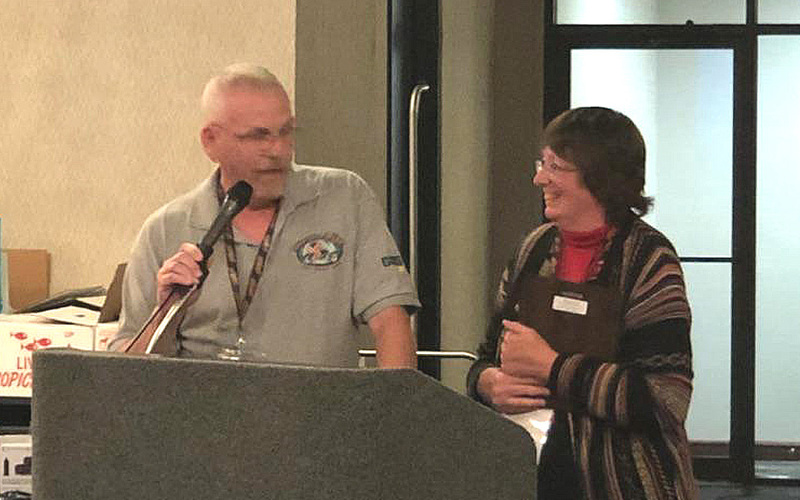 The photo depicts Phil as he presented the award to Jan. Congratulations, Jan, it is well deserved. Be sure to pay the ACA a visit! It’s that time again. Every year the ACA puts out a call to its members to become a part of the BOT. Likewise, every year I hear complaints that nothing ever changes. The same old people are running. Yada yada yada. Well, here is your chance to make a difference. Instead of sitting back and doing nothing, run for the BOT. You can make a difference. This will be my 8th year as a BOT member and I have seen a lot of different “styles” of participation. I, for one, am not one to sit on the sidelines, like a mope, but I wade right in. What the ACA needs is innovative, energetic people, young or old, that will not just sit like bumps on a log and vote but roll up their sleeves and get the job done. Usually people vote by name recognition. “Oh yes, I have heard of him or her, they should be good.” A lot of talented people get passed by that way. So, please submit your bio, tell us what you would like to do in the ACA and give it a whirl. When it is time to vote, please, read the bios, get a feel of what the person would like to do, and don’t be afraid to make a change. Daryl Hutchins and yours truly are your Election Co-Chairs so please send your bios to: ACANEWSLTR@gmail.com. When I first became Chair and waded in to things, Peter George and I noticed that the ACA name was never trademarked. How could the organization exist for 50 years and not have its name protected? Your guess is as good as mine. So, Tim Hovanec and I got the ball rolling and the deed is finally done. 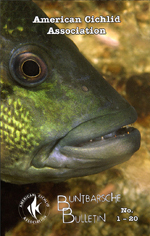 The American Cichlid Association is now protected and trademarked. Why is this important? If I recall the whole FB debacle, someone was using the ACA name yet claimed that it was their property. I know, not cool, but what are you going to do? What we did was protect the ACA. That’s all for this month. Be good to your fishes (and Editors). Take it easy for a few weeks, the end of summer is right around the corner. “Already?” you ask. Unfortunately, yes. Enjoy the warm weather and I’ll be back in a few weeks. 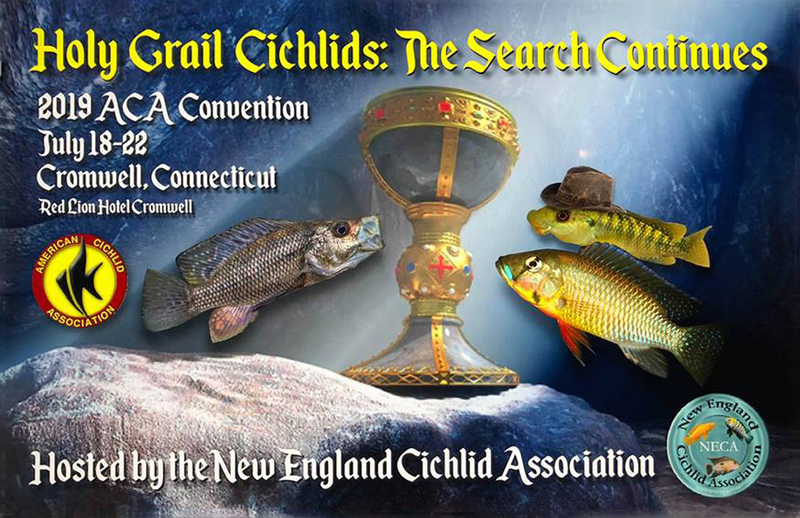 The 2019 convention is in Connecticut. Please check out the link to get more information about our annual convention. As usual, all of our conventions are full of fish, friends and fun. Plan to be there for the festivities. If you have not yet enrolled on the ACA Members-only FaceBook page, please do so now (click the “f”). Thanks!